I do not know what it is, the heat, the humidity, or the different time zone to the UK, Malaysia being eight hours in front, but often I need an afternoon nap, a small sleep in the afternoon. This afternoon sleep, may last from ten minutes to one hour, but I find it such a deep sleep, the whole body plus my brain seems to shut down. When working in Saudi Arabia, we had a time when the office hours were changed from working 9am – 6pm, to working 9am – 1pm, we would then go home to return to the office at 5pm and work until 9pm. I would enjoy an afternoon sleep, away from the midday heat, but what a waste of a day, by the time we had returned home in the afternoon, had lunch and a nap, it was time to go back to the office, and in the evening, by the time we got home, prepared a meal, it was time to get to bed. On my many trips to China giving training, it really confused me to see straight after lunch, office workers, participants, ordinary people, suddenly fall asleep at their desk, in their chair, but just for say half an hour. Much research has been undertaken on afternoon naps, or what is known as “power-naps”. In a California University, many years ago, researchers undertook tests on a group of cats. The cats were taught a challenge, something special to do, and their brain waves were monitored. After a while the group of cats were split into two, and one of the groups was allowed to sleep or nap, whilst the other was allowed to learn the challenge. A while later, the group of cats were woken, and the two groups were tested on how well they had learned the challenge. It was the group of cats that had slept who had mastered the challenge better. Sleep had increased learning. Whilst the cats were taking the nap, researchers noticed unusual brain activity, and at a time when the sleep was at its’ deepest, when the cats entered REM or Rapid Eye Movement sleep. The researchers said that this was the first time they had seen the brain learning, the short-term memory passing information to long-term memory, a function they called the plasticity of the brain. Further research has been carried out on REM sleep, in Harvard University (USA) and University of Surrey (UK). It was found that when nappers took 1 hour to 90 minutes sleep say around 2pm, and which involved slow wave sleep, that is light sleep, which also included REM sleep, that is deep sleep which is often identified with dreams, they performed better than those who did not sleep or had a “power-nap“. It was also noted that the “power-nap” enhance performance of work and duties in the afternoon, but remarkably only if REM was achieved as well as light sleep. Also noted was that the “power-nap” was no substitute for a normal good nights sleep. Research at the New York-Presbyterian Hospital/Weill Cornell Medical Center suggests that a nap does not effect the normal nights sleep, in fact they found that the nap could be beneficial for improved cognitive performance, to perform arithmetic, decision-making and reaction time tests and mental for up a day after. 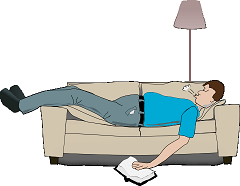 It is said that there have been famous and great “power-nappers” in our time including Margaret Thatcher, Bill Clinton, Lance Armstrong (the cyclist), yachtswoman Ellan MacArthur, Leonardo da Vinci and Thomas Edison, and that they could/can exist with a few hours sleep a night. But experts say that a full night’s sleep is still necessary for many bodily functions. Will a “power-nap” influence the circadian rhythm or biological clock? No, only if you take more than 90 minutes for a nap. So sleep and nap well, I will.